The capital city of Hanoi plans to welcome 3 million foreign tourists this year with a hospitable and safe environment for both visitors and enterprises. At a talk on the capital’s tourism development in Hanoi on January 8, Director of the municipal Department of Culture, Sports and Tourism To Van Dong vowed all possible changes to make Hanoi live up to its reputation as an attractive destination. Specifically, the Ba Vi – Suoi Hai area will be transformed into a national tourism park while projects redeveloping the popular Giong festival space and increasing community-based tourism to Ba Vi will be completed. Areas around Ngoc Son temple, Sword Lake, Hoa Lo Prison and the Temple of Literature will have better infrastructure and tourist services. The department is asking for 50 hectares of land near Nhat Tan – Noi Bai highway to build a display space for Hanoi traditional craft products. The sector will also work and spend hard to popularise images of the city. 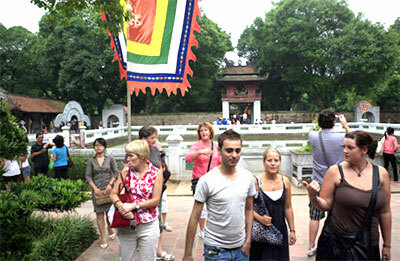 A tourism promotion unit will be run by the municipal People’s Committee, instead of the department. The cost to promote tourism in Hanoi stands at a modest 1 USD each person, while in Ho Chi Minh City, the figure is 2.5 USD. That compares to Thailand, Singapore and Malaysia which boast respective spending of 10, 16 and 20 USD per person. Nguyen Bich Dung, Sunway Hotel Director of Business and Marketing suggested the sector team up with global airliners to launch direct flights to Hanoi. In the recent past, Hanoi has launched a hotline to deal with complaints by tourists and kept a close watch over tour guides and transport. Last year, the city greeted 2.58 million foreign arrivals, up 22.9 percent year-on-year, generating 38.5 trillion VND (1.83 billion USD) in revenue – or 14-15 percent of its gross domestic product.